You can always smell the bread cooking in our home for waifs and strays. It was the same in my home, as a child. When my father wasn’t blowing up the place with his experiments, he would spend much of the time in the kitchen. His speciality was bread and brawn (a jelly made from pigs head) which ultimately traumatised me but fascinated my brother. Well I hasten to add that just like the tickling of an unsuspecting trout, I never participated in the eating of an animal that had ended its days as a blob of jelly on our kitchen table. However, I get great pleasure in making bread and my kind and unassuming husband gets pleasure in eating the many varieties that turn out on the rack. Even the birds enjoy the scraps that are left over, if they are lucky! Sometimes, I will make butter and jams to go with the bread but for that, I have to be in the right mood. 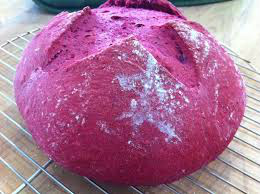 The other day, I decided to make beetroot bread. Yes, I know what you are thinking and yes, it is pink! Pretty and also good for lowering blood pressure. I used this recipe by Anca Moore...Why not have a go and let me know how you get on! Good luck! Peel the beetroot (you might want to use gloves if you don't like your hands getting red, but it will come off quite easily anyway). In a big bowl mix the flour and salt. Add the yeast, beetroot mixture and olive oil and start bringing the dough together. Knead the bread on a clean surface for about 10 minutes. Put the dough in a big bowl and cover with a lightly oiled clingfilm and leave it in a warm place for about an hour or until doubled in size . Knock the dough back, remove from the bowl and shape into a round . Put in in the prepared tray, cover with the lightly oiled clingfilm and leave it to rise for another 30-45 minutes. 10. Make a cross on the top of the dough with a sharp knife and bake it in the oven for 35-40 minutes. It is done when the crust is crispy and it sounds hollow when tapped. 11. Allow the bread to completely cool on a cooling wrack before slicing it. It is really lovely served with butter and cheese (especially goat's cheese) and salad.